The sertão is no longer able to hold its inhabitants. Its agricultural structure, rigid and feudal, excludes on principle the possibility of the sertanejo (man of the sertão) having at his disposal even the smallest parcel of land for subsistence farming. In turn, deforestation of the area continues to spread, aggravating the phenomena of drought and desertification in the northeast. The inhabitants abandon the countryside, seeking survival in the large cities and heightening the problem of the rural exodus. For example, Fortaleza, the capital of Ceará, saw its population quadruple in only a few years, transforming it into one of the great shantytown cities of the Americas. 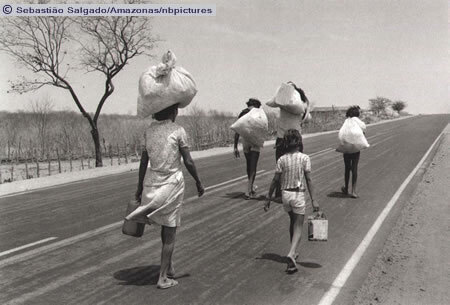 Ceará, 1983.